Available the 1st of September, the Mavic Lab program will gove you the opportunity to custom imagine your R-SYS through a batch of options. We noticed the Ultra SL rims, the ceramic bearings, the lightened spokes, and the possibility to have the rim engraved. 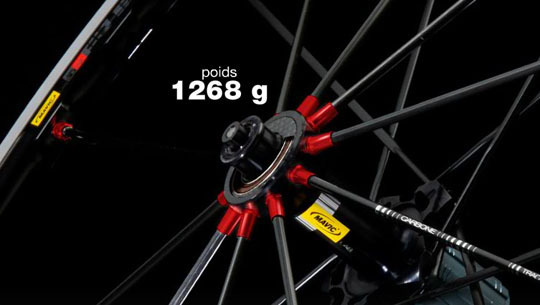 From 1350g as standard, it is possible to lighten the wheels down to a theoretical 1268g. The price of the options is reaching higher summits than ever… 2500 euros for a pair of R-SYS with ceramic bearings and titanium rotor, do you believe it? He recently made a pair of special hubs. Their weight is within the standards with 75g front and 205g rear and they look quite classic. So what do they have special? Contrary to most current hubs, every parts of this hub are made out of titanium instead of aluminium: shell, rotor, end caps, etc. So the hub is very hard and should last forever. 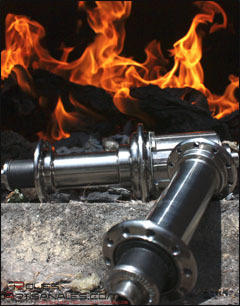 The setting system is well thought and easy to use, the bearings are large enough to be pretty durable. Time will tell. From a geometry point of view, the spacing between the flanges should comes with a good lateral stiffness. However, the drive side flange diameter is quite low compared to what we currently find on the market. It gives a « vintage » side to the hubs that should well fit with a flat rim…why not in carbon.